and discover the Spiritual Teachings, Ancient Wisdom and Personal Growth the Drum offers. Discover the Spiritual Teachings, Ancient Wisdom and Personal Growth the drum offers. These teachings are woven into the very fabric of the drum and will be shared throughout the workshop. Building a drum is a way of unlocking, passing and carrying on that knowledge. Mothers and daughters, fathers and sons, grandparents and grandchildren, brothers and sisters, the whole family can make a drum together. Join the long line of drum makers, players and singers in your community and around the world. Cedar rim, various sandpapers, high quality prepared goat skin, rawhide cording, all natural oil finish, and full instruction is included. The day begins with the setting of intentions and ends with instruction for drum care and sharing of songs. Wooden Drum Stick with leather bound head is included. Book your workshop today and reserve your drum size now. Space is limited. Wear comfortable clothing and be prepared for dust while sanding. As one smooths the rough edges of the drum, they smooth the rough edges of their own being. This workshop is approximately four to five hours long, including one hour break (pack a lunch or visit nearby restaurant). To ensure everyone receives enough attention and assistance, group size is limited to 12 people. Suitable for ages 14 and up. 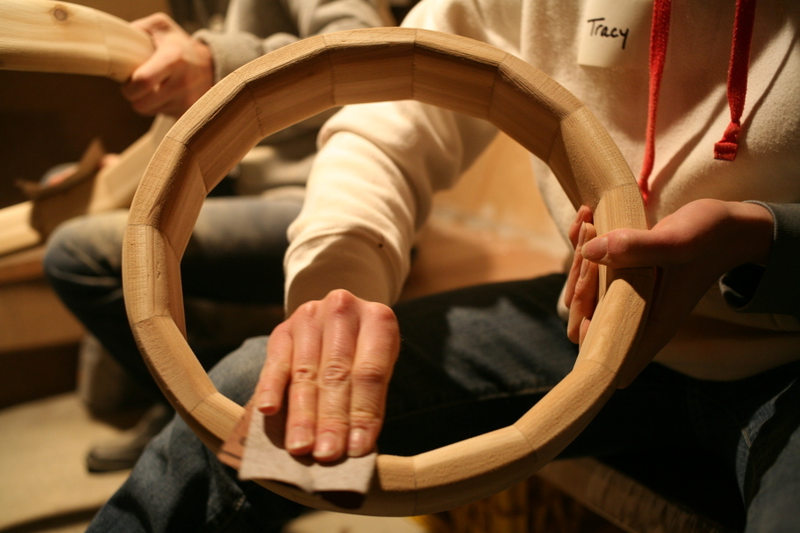 To book a Drum Making Workshop, reserve a space, or for supplies, please contact us.